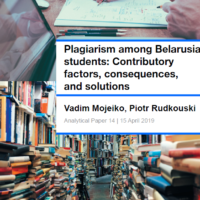 Belarus Digest launches a regular series of publications reviewing Belarusian state newspapers. In the first publication of the series, Belarus has taken further steps to confirm its independence vis-a-vis Russia. Pro-government experts in Minsk have criticised the Russian elite for increased nationalism. This rhetoric sees Belarus as an integral part of the Russian space. At the same time, a pro-Russian journalist stated that Svetlana Alexievich got her Nobel prize due to the support of the West for her anti-Putin rhetoric. Belarus has expanded its presence globally. Minsk hosts a high level meeting of the International Electrotechnical Commission. his organisation gathers leading businesses and experts in this sphere. The first Belarusian station in Antarctica will be constructed by 2016 and provided Belarus with access to this Continent. It will allow Belarus to engage in scientific research. At Lake Baikal there remains a Belarusian village, which while thousands of kilometres from Belarus still retains Belarus's unique culture. All of this and more in this edition of State Press Digest. Pro-government experts criticise Russia. Belarus Segodnya, the largest national newspaper, analyses pro-government experts’ comments on the development of Belarus after the 2015 presidential elections and how the international political and economic situation impacts Belarus. Director of the Centre for European Integration Jury Šaŭcoŭ argues that because of the new geopolitical situation the West stopped supporting 'radical nationalists' in Belarus. The EU realised that a strong authoritative regime in Belarus curbs radical and destructive forces. He thinks that the Ukrainian scenario is impossible under these circumstances, and moreover, Belarus is a bridge between the two poles of Europe and Russia. The analyst at the pro-government Cytadel think-tank Aliaksandr Špakoŭski also says that the West has changed its strategy in Belarus​. The West rejected colour revolutions as a means of regime change, but still wants Belarus to establish western standards of political and social order. The West will seek to achieve this through engagement with Belarusian society and the political leadership. it will try to integrate Belarus into its sphere of influence. However, Špakoŭski also accuses Russia of a growing nationalist hostility towards Belarus and its position on Ukraine. He argues that Belarus should preserve armed neutrality towards both conflicting neighbours. Acording to Ihar Marzaliuk, MP and a famous historian, Belarus will never be a satellite of Russia, although Russia was and currently remains a strategic partner of Belarus. “We are interested in integration with Russia economically, socially and militarily, but this should be a union of equal sovereign states,” the expert says. Authorities organise youth debates. The newspaper Žyccio Prydźvinnia reports on the youth project Open Debates. This was organised by the Ideology Department of Viciebsk district executive, the Belaja Ruś and BRSM GoNGOs and government-controlled trade unions before the elections. Schoolchildren, students and soldiers were divided into teams to debate political issues. The organisers say they want to develop political and civil culture among Belarusian youth. They want to teach them to promote their views and see elections as a mechanism of influencing the government. The main reason behind it was perhaps to secure a high turnout among the young, but the authorities apparently started to understand the importance of civil discussion. Nobel prize for Russophobia? In the article “Was the Nobel prize awarded to the right per​son?” Soyuznoe Veche, the newspaper of the Parliamentary Assembly of the Belarus-Russia Union, takes a critical stance towards Svetlana Alexievich's Nobel prize. According to the article's author, the West wants to hurt Russia. 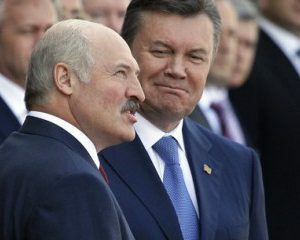 By awarding the prize before the presidential elections it aimed to help the Belarusian opposition. These are the opponents of Belarus-Russia Union State and so it was an attack on Russia too. The author concludes that the politicisation of the award will hang over the writer for the rest of her life despite the fine quality of her work. Meanwhile, Vecherniy Brest (Evening Brest) reports that Alexievich's books are practically absent in Brest's bookstores. However, after the news on the award people immediately rushed to buy her books. Belarusians in Antarctica. Soyuznoe Veche continues with a piece about the construction of the first Belarusian station in the Antarctic. The station is due to be constructed at the start of 2016. It will be transported to the South Pole on a Russian ship and will be placed on the spot called Hara Viačerniaja (Evening Mountain). 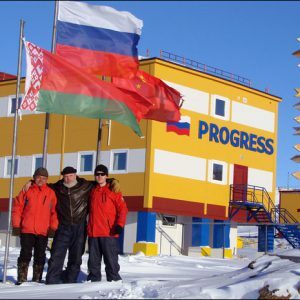 The Head of the National Centre for Polar Studies, Alieh Snycin​, says that building Belarus's own station is a matter of national prestige. Importantly, to receive the status of a participant of the international agreement on the Antarctic, Belarus has to fulfil a number of conditions. One of them is the building of a station. Antarctica contains huge reserves of hydrocarbons and other treasures, which Belarus hopes to get a piece of. High Level Meeting of Electronic Experts in Minsk. On 5-16 October Minsk hosted the 79th General Meeting of the International Electrotechnical Commission (IEC) in Minsk with 1,500 delegates. This was reported by Zviazda daily. The IEC is a worldwide noncommercial organisation which produces international standards for the free movement of electronic goods. The meeting also serves as a major business forum in the field, which gathers representatives of leading companies in electronics, IT, and energy. For Belarus it became a rare opportunity to demonstrate its potential for investments, improve its image abroad and promote Belarusian production. Belarusian traditions in Eastern Siberia. Holas Radzimy newspaper writes about the Dažynki harvest festival in the village Turheneŭka located in the Irkutsk region of Russian Siberia, near Lake Baikal. Although the region is largely inhabitated by ethnic Buryats, this Belarusian vilage, which was founded in 1909, is similar to other settlements near Lake Baikal, which exist even today. Local Belarusians preserve their traditions and rites. The villagers perform traditional folk songs and dances. A group of producers for the Belarusian ONT TV channel visited the festival to as a part of a series filming people who retain their identity far away from Bealrus. According to the 2010 Russian census, currently about 8,000 Belarusians live in the Irkutsk region. Alternative cinema comes to Minsk. Zviazda newspaper is advertising the film festival Bulbamovie ('Potato-movie'), which will be held in Warsaw, Cracow and for the first time in Minsk. The fact that the festival is advertised in the state press and will be held in Minsk looks at the vert least unusual. The festival has long been working as a free site for alternative Belarusian cinema with movies often critical to Belarus​'s political reality. The state has a monopoly on film production and during Lukashenka's rule the state cinema has largely made films based on Soviet patriotism and World War II episodes.